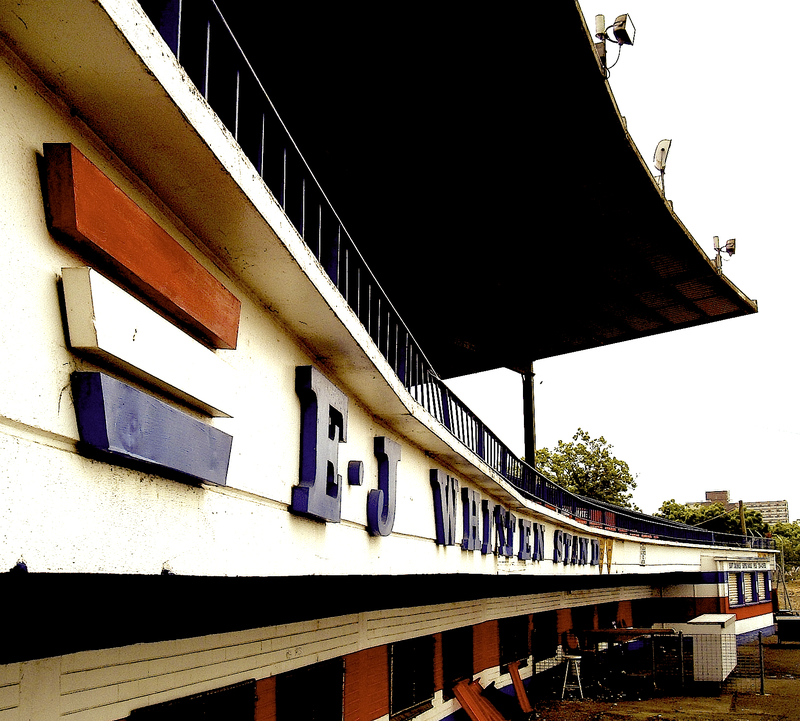 Western Oval: League venue: 1925-1997. League (VFL/AFL) matches: 665 . Record Attendance: 42,354-Footscray v Coll’wood, r.121955. 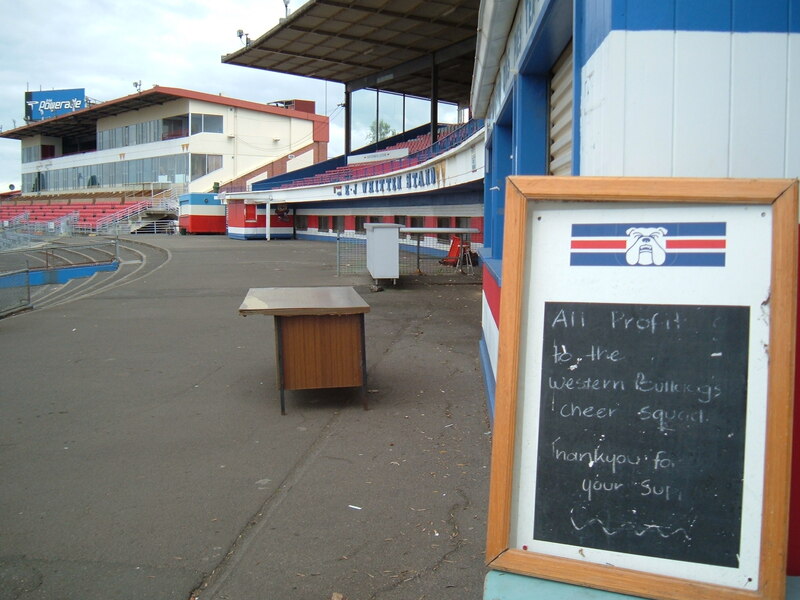 Having already looked back at the old league venues in Fitzroy and Hawthorn, we now head across the Maribyrnong river to Footscray’s Western Oval, now the Whitten Oval. Growing up in Melbourne’s leafy east, to me Footscray seemed an eternity away, both in distance and way of life. 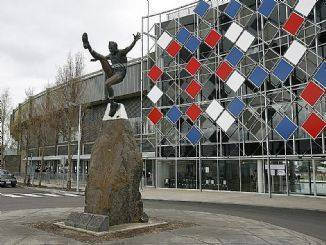 Fast forward to 2012 and I now live just a few drop kicks and a decent torpy away from the old Western Oval, many myths about Footscray having been debunked along the way. I took this series of photos when the ground still stood essentially as it was since top-level football departed it in 1997. Little did I know that the following week saw the scoreboard come down and work begin on the new developments at the kennel. While understanding the need to move forward, I’m sure glad I captured some of the old nooks and crannies that I did before it all came down. I have watched with great intrigue over the past few years the developments at the oval, and have been pleased with how they have come about. While not as in depth as Victoria Park’s recent refurbishments, the Dogs have maintained much of the grounds feel, including a large section of old-school terracing which still exists behind the Geelong Road end goals. There is however a trendy cafe these days residing between the two old grandstands, a far cry from the old Western Oval where the Scraggers plied their trade. 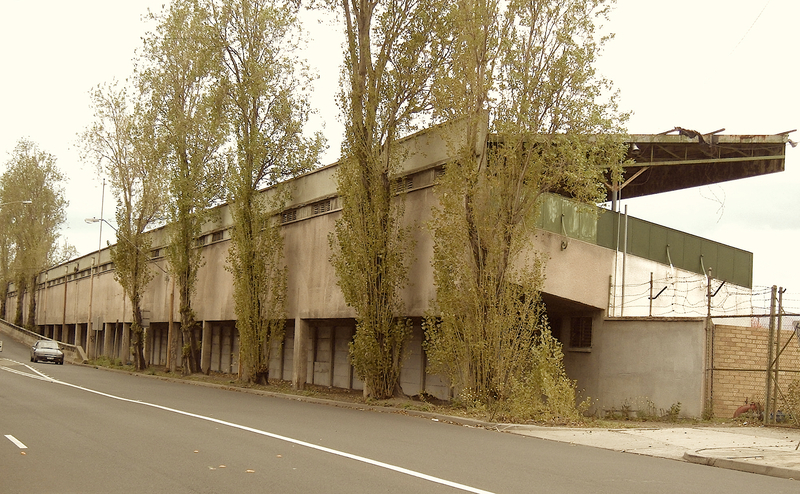 The two old stands, and on the right the new cafe and administration joins the two. When it came to the redevelopments, there were elements of the ground deemed necessary for demolition. First to go was the old scoreboard. I took these photos just days before its demise, with the remnants of ‘congratulations’ for Chris Grants 300th match still on the board. I also love the old wooden seating in the foreground which stood until recently, a world away from todays plastic bucket seats. They look more like pews, where supporters could kneel and pray. Whilst snooping around, I ventured into the scoreboard, quite tentatively as I’d heard that it was a home to squatters. 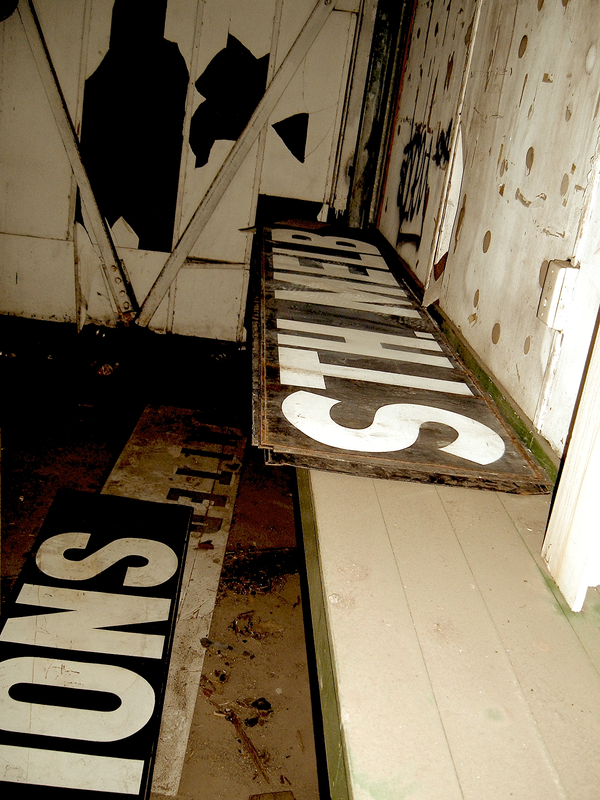 This photo shows the old South Melbourne board, which must have sat there gathering dust since 1981. How I wish that I had grabbed the sign! What fascinated me most about the Western Oval however was the Gordon St side of the ground. The Doug Hawkins wing. 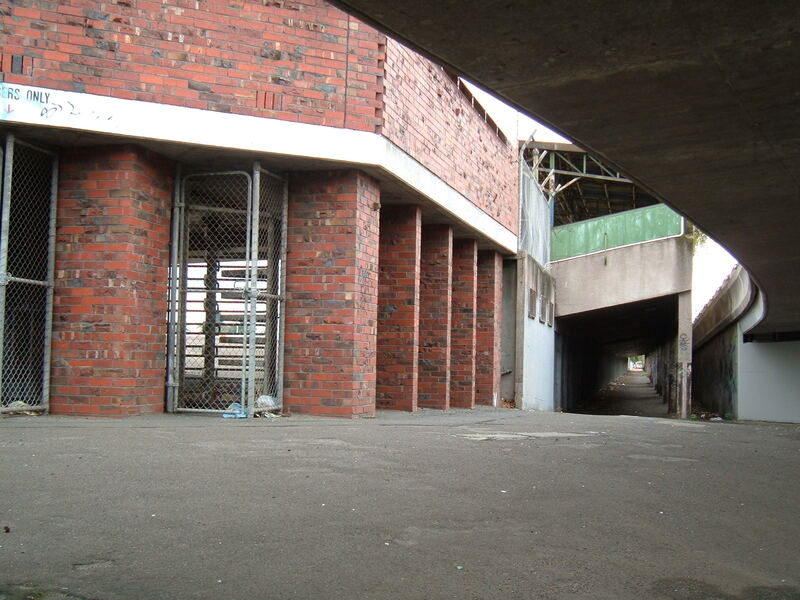 I just loved the integration of footpath, EJ Smith grandstand and Geelong Road bridge, with many a dark corner to explore. I was sad to see this go as it was just full of character, a stark contrast to todays near uniform stadia. The Western Oval is now an elite training facility for elite athletes and will obviously not be hosting any more league matches. But the ground still has that old feel about it. 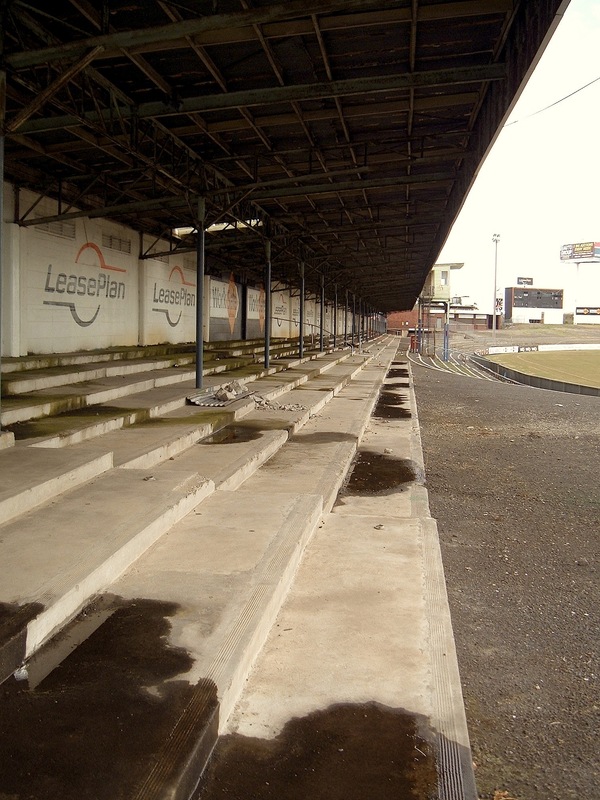 There’s plenty of terracing left, the old stands are intact and the ground is well cared for, unlike others which have been left to decay. The Dogs still get a decent sized crowds to their intra-club matches too. The one glaring admission is no signage to acknowledge the Dougy Hawkins Wing. I hope this is rectified at some stage. And be sure to check out Vin Maskell’s piece on the old Western Oval scoreboard on his Scoreboard Pressure site! 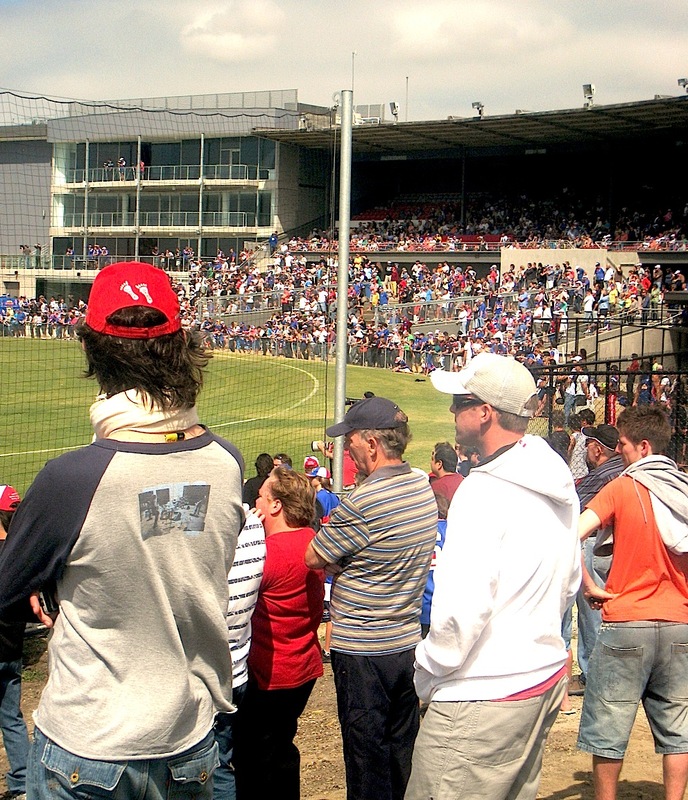 This entry was posted in Home & Away and tagged afl, Doug Hawkings, footscray, local, redevelopment, scoreboard, terracing, VFL, Western Bulldogs, Western Oval, Whitten Oval by theholyboot. Bookmark the permalink. Nice work once again, Holyboot.I can’t imagine people being nostalgic about Etihad (or whatever it will be called) in 30 or 40 years time. And good to see some photos of the soreboard. What a hoot, Holyboot. No, agreed. There was some nostalgia for Waverley Park when it subsided however, perhaps a phenomenon? Waverley Park, now that’s a scoreboard I’d love to see featured! I’m Richmond, from a mixed family… Brother is a Doggie, and Dad is a Blood (still calls them South), so we used to go to games at the G, the Lakeside Oval and Western Oval. Remember seeing the Tigers win big (1980? ), and lose big as well… Usually after Kelvin Templeton or Simon Beasley kicked bags of 10 or so. 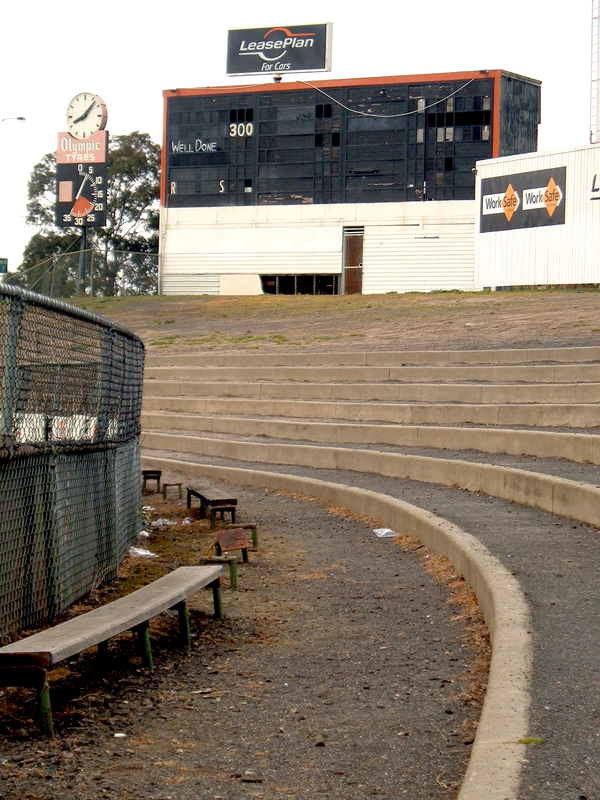 Love the old ground posts… Miss the days of traveling to away games in Melbourne. The new G and Docklands lack the character of the suburban grounds.